We absolutely love decorating for Fall and Halloween. Not only do we decorate our house for Halloween but we also enjoying decorating our yard for Fall. You can use candles a variety of different ways to add fun accents to your decor. Crafted Candles offers a large variety of taper, votive, and pillar candles for any season or holiday accent. Decorate your table with tapered candles in a black candelabra to add a more glamorous accent while dining on your spooky treats. I have a side table I love to decorate with a primitive tablecloth and my Joe Spencer Gallerie II dolls. I also add some pillar candles with Fall and Harvest written down the sides. 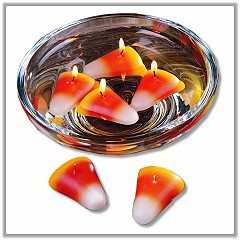 Add a glass jar with water and place the fun floating candles like the Pumpkin Patch or Candy Corn ones at Crafted Candles. I love their Jack-o-Lantern candles that could be added to a basket for some added fun. Candles like this you don’t even have to burn. Just place them out year after year. Having a fun cake at your Halloween party? 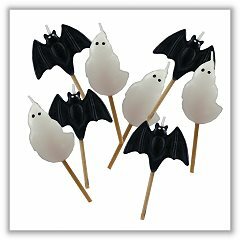 Add some of Crafted Candles Spooky Bat Party Candles! Like Crafted Candles on Facebook and you can get access to exclusive Fan-Only coupon codes and promotions! Right now they are offering 10% off your order! One lucky winner will receive a $100 credit to spend at Crafted Candles! This can be applied to shipping as well. It is open to US and Canada ages 18+. Enter to win via the Rafflecopter entry form below. Giveaway ends November 11, 2012 at 11:59 pm EST. Good luck everyone! Disclosure: I received no compensation for this publication. My opinions are my own and may differ from those of your own. Giveaway Bandit is not responsible for sponsor prize shipment. This post is sponsored by Crafted Candles and powered by Couponista Queen. I would buy the cupcake candles, Day Lily Flower Floating Candles , Green Birdswing Butterfly. I would get the Double Spiral Gold Edge Beeswax Taper Candles and the Holiday Stripe Pillar Candles. Love the heart and rose floaters. The Glitter Trees or Holiday Strip Pillas would look great with my Christmas Centerpiece. And I can never have too many glass holders either. I might purchase aHoliday Stripe Pillar, A marshmallow Snowman and a Merry Moose Glass Ornament Tealight Candle Holder. I would get the Poinsettia Blossom Floating Pool Candles and Glitter Star Floating Candle. I love the floating ones, in particular the Butterfly, Flower & the Spring & Summer Floating Candles. I thought the cupcake candles were cute. I would defiantly get the cupcake and floating peppermint candles.. I like the cupcake candles, metallic ball candles, Unity Rose Candle and Home Green Soy Jar Candles. The Langley Gel Candles sound interesting. I love all of the Christmas ones, but in particular the candy cane pillars and christmas cookie floating candles. I like the Glass Ornament Tealight Candle Holder, Glitter Tree Candles, and Holly Double Spiral Beeswax Taper Candle. I would get a bunch of their Christmas candles.The Mistletoe Floating candles are really cute. The flower candles are beautiful! I’d get some of them for sure! The wine cork candles for my mother in law and the candy cane pillar candles for me! I like their Santa Claus Floating Candles & Peppermint Floating Candles – Scented – (Set of 6)! I would get the floating disc candles! THEY’RE SO PRETTY! I would get the birthday candles,,I just don’t know which ones they are all so cute. And I would get the red and green holiday striped candles. I would definitely get one of the Christmas Tree candles as well as the Indian Corn. Sooo many fun ones to choose from and would make great gifts!!! Marshmallow Snowman Candle and the Candy Cane Pillar candles are what I would order! These candles are amazing! I love the Fall Candles, especially the Cinnamon Stick Orange Candles, the Gourd Candle, and the Harvest Leaves Beeswax Pillar Candle. Thank you for the fun give-away. The skulls are awesome, I would love them! I’d get all of the butterfly floating candles for the pool. I would get the Glitter Tree Candles and the Fragranced Taper Candles in Hollyberry. Wow! super candles makes it so very hard to choose.. I love the Harvest Leaves Pillar, and the butterfly and dragonfly floating candles. love the ornament ball candles (not the ornament candle holders!) and the snowmen ones… and a bunch of others! The floating leaf and pumpkin candles, apple halves floating candles and the cinnamon stick oranges! double spiral gold edge beeswax taper candles and the christmas tree with the little red bird on top! I would get a case of the designer jar candles in spring rain and fill up with some other scents. I would get the butterfly floating candles. Would definitely get some of the Christmas candles…the Candy Cane Pillars and Floating Christmas Cookies are too cute! The candy cane pillar set is adorable!!! I would get the Snowcap Tree Candles. I would also get some of the dishtowels, especially the Autumn Harvest set. I think some of the flower floating candles are beautiful. I like the Johh=nny Jump ups and Pansies, especially.